My fellow fiction author Nicholas C. Rossis just released a new book of short speculative fiction stories. I have enjoyed his past short story collections (The Power of Six and Honest Fibs) and thought you might too. He graciously accepted my invitation to share the news and included a sample short story. He also is offering a complimentary copy of his book to any of you who requests it (see the link below). Congratulations on your new book and thank you, Nicholas! Read for free with KU or request a free review copy! As always, anyone interested in a free review copy can contact me and I’ll be happy to send them one (or to enroll them in my ARC list, of they so wish). The delegate casts him a distressed glance, then starts pacing back and forth, mumbling. He only pauses twice: once to curse at the transparent material that seems to be mocking them, and once to curse at the aliens who have placed it there. The all-powerful creatures who have built their fortress next to the colony, paying no attention to its inhabitants and their needs. The enigmatic neighbors have brought much-needed supplies with them but have steadfastly refused to share—or even acknowledge the colony’s continuous pleas for cooperation. 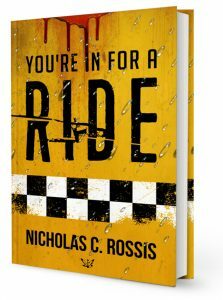 If you enjoyed that, you can read You’re in for a Ride for only 99c for a limited time only or request your review copy for free! Aw, it was a pleasure! Thanks for your generous offer to my readers.